Projection Mode is activated by selecting the profile icon, then clicking Administration > ONTRAPORT Labs and selecting the toggle to turn the feature on. Projection Mode uses your Campaign’s current stats to predict how changes will affect your overall Campaign. 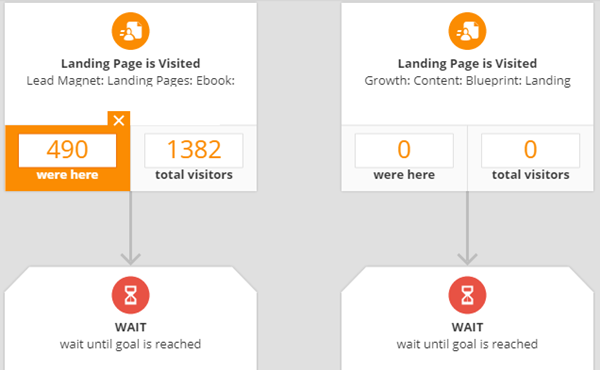 Adjusting the number of Contacts or the conversion percentage on a particular Trigger, Goal, Wait, Condition or Split will instantly display a "what if" scenario, showing you the impact of that change on all the downstream elements. Note: ONTRAPORT Labs includes new features that add significant functionality but are not yet completely finished. When all of the functionality is added to Projection Mode it will move out of ONTRAPORT Labs and into the main application. Until that time, feel free to activate it and use the functionality that has been completed. 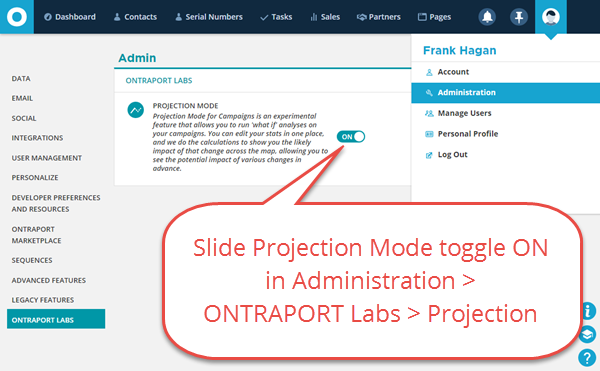 In ONTRAPORT Pro or Team accounts activate Projection Mode by clicking on the profile icon and clicking Administration >> ONTRAPORT Labs >> Projection Mode. Slide the toggle to the ON position. Projection Mode is based on the current Contact Flow report shown in Performance Mode. The Contact Flow report is the default report when you open Performance Mode, and shows you how Contacts have moved through the map and where they are now. All elements downstream of the edited element will adjust for the new "what if" scenario. 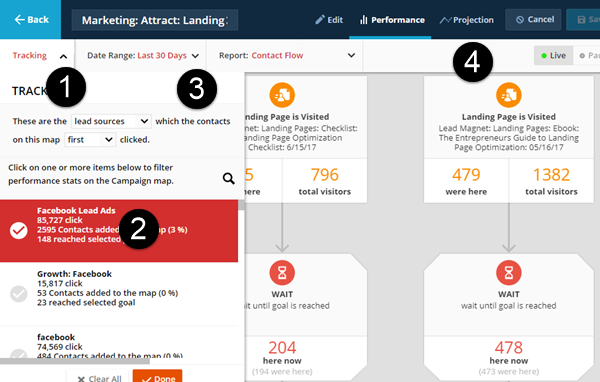 Configure your Contact Flow Report to show only the Contacts coming in through your lead source by clicking the Tracking drop down at the top left (1), selecting the Lead sources you want to report on and clicking Done (2), and adjusting the Date Range (3). Click the Projection mode link (4) to display your report in the interactive format. 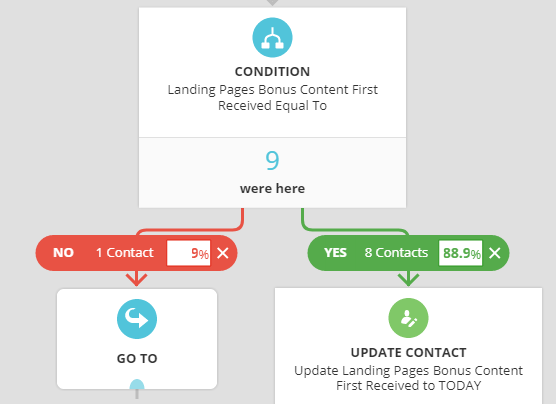 The Contact Flow report will appear with the stats you can edit outlined in Triggers, Goals, Waits, Conditions and Splits. Click on a statistic to edit it. To restore the original value, click the X at the top right of the stat. Splits and Conditions will have the editable stats displayed in a similar manner. Elements after the value you edit will update to display what would happen based on the new value. In this case, if we double the Facebook Lead Ads budget, we should be able to double the number of contacts signing up in the Trigger shown in step 2. When we edit that number, the Goal for "Purchases Product" farther down in the campaign path will update accordingly. Will the number of sales make up for the additional spending? Projection Mode allows editing one or more of the Trigger values to see how the downstream elements would be affected. This can quickly reveal the highest converting Trigger in the Campaign. Sample size will have a huge impact on the accuracy of any projections. 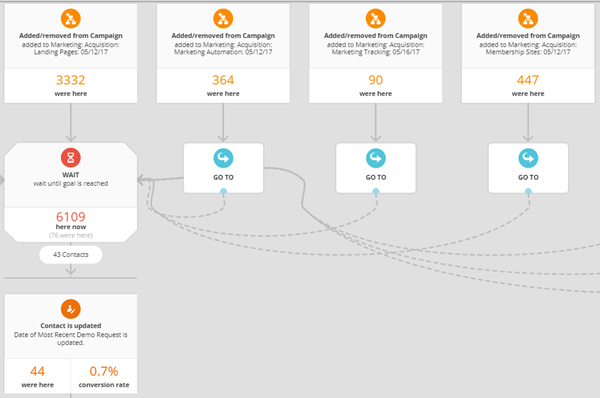 Projection Mode simply uses the existing stats in your Campaign to provide an estimate of the impact of the change you enter. The larger the number of Contacts on the Campaign Map the better the estimate becomes. In statistics, this is called the "confidence interval". A Campaign with 100 contacts per branch in the Campaign will have less accurate results than one with 500 in each downstream branch. Keep this in mind when looking at the results. Disclaimer: As with any statistical forecast, the results should be evaluated and considered only as a part of your decision making process. Past performance is not a guarantee of future results, and we make no representations about the accuracy, reliability, completeness, or timeliness of the content or about the results to be obtained from using Projection Mode.